In years 7, 8 and 9 pupils are taught in mixed ability groups. Pupils receive one lesson per week. Year 7 During year 7 pupils will cover three main topics and themes. Pupils study a variety of welsh artists including Tim Pugh and Andie Clay, where pupils will experiment with different materials. Pupils will study the work of Jasper Johns and will design and create a 3D letter. Pupils will also experience still life observation drawing and the work of Picasso. Year 8 During year 8 pupils will study the work of Gaudi and Hundertwasser and design an imaginary city scene. Pupils will design and create a carnival mask. Pupils will also study the work of Vincent Scarpace where they will create a brightly coloured semi 3D fish. Year 9 During year 9 pupils will concentrate on two main topics, natural form and portraits. During these topics pupils will experience a variety of techniques, materials and art styles. 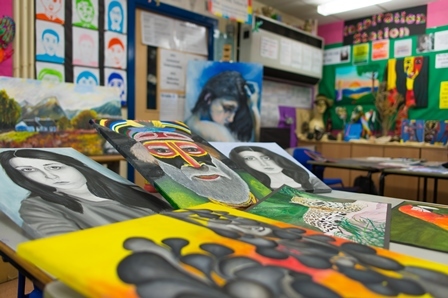 Pupils who choose to study Art and design at GCSE receive three lessons per week. The course is made up of 2 components. The portfolio which is completed in year 10 and the first term of year 11, this counts for 60% of the final grade. The Externally set task (exam) counts for the remaining 40%. The exam is made up of a preparation period which is usually around 6 weeks and the ten hour practical exam. During the GCSE course pupils work on a wide variety of themes and have the opportunity to experience a range of materials and techniques.